Blogging my way through the Oscars, one nomination at a time. Nominated for Best Animated Feature Film (Chris Sanders, Kirk DeMicco, Kristine Belson). 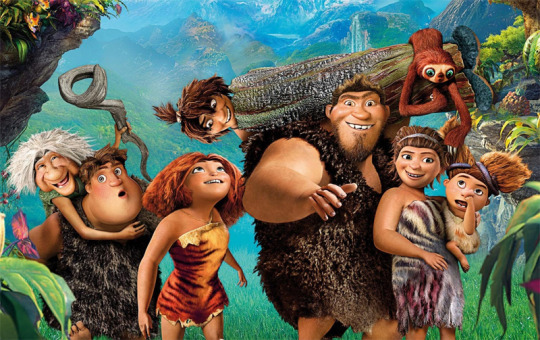 If I could suggest one thing when viewing “The Croods,” it would be to not read too much into the plot and characters and just enjoy the story for what it is. A pre-historic cave family has their home destroyed and must set out across the unknown in search of safety and a new cave. With the help of a slightly unwanted stranger, they discover what it is to embrace change and to face adversity together as a family, even if your family is stupid. That synopsis might not sound too bad until you get into the grit of things. Grug (Nicolas Cage) is the father, and he is fiercely opposed to any kind of change or outside thinking. When his daughter Eep (Emma Stone) tests the limits and then meets an outsider named Guy (Ryan Reynolds), who is also an inventor, he does what any typical dad would do and tries to lock her in the cave. When their home gets destroyed, everything changes and Grug reluctantly follows Guy and Eep, along with his wife Ugga (Catherine Keener), crazy Gran (Cloris Leachman), son Thunk (Clark Duke), and little one Sandy (Randy Thorn) across the unknown. They face perilous adventures with wacky creatures and explore lands full of vivid colors. Grug is obstinate the entire way and refuses to accept a new way of thinking. This is where things could get weird. The parent is refusing to see another point of view and won’t listen to his teenager. On the other hand, the teenager thinks she knows best and is drooling over a boy. The boy seems like the most level headed character, even though he has a sloth for a belt and he invents things like fire. He is all about progress and moving forward and sees little value in tradition. The dad is stuck in his ways and resists change to a fault. He apparently doesn’t use his brain, according to the film. The black and white representations of opposing sides of society could be that, or just a typical plot point in a children’s film. You make the judgement call. The story telling is predictable, albeit entertaining and funny. There are some basic plot points, although surprisingly both parents last at least the majority of the film, whereas most films for kids feature a dead parent. The kids have to go through some great emotional turmoil to make them understand the value of family, even when they’re being stupid, and nature continues to beat the cave people into submission. I feel like this review came off more negative than I intended. Like I said, the colors are fabulous, the film is entertaining and funny, and I enjoyed the animation. I don’t know how quickly I would watch the film again because, let’s face it, it’s no Shrek, but it wasn’t the worst film of 2013, that’s for sure.